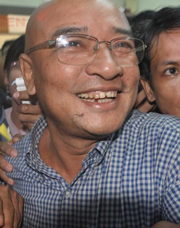 Zarganar, a well-known Burmese dissident and popular comedian, was released from prison Wednesday morning under a government amnesty for over 6,000 prisoners. Over the past two decades, he was frequently jailed or detained for his political activities as well as for making satirical jokes about Burma’s military rulers. Prior to his release, he was serving a 24-year prison sentence in Myitkyina Prison in northern Burma for publicly criticizing the slow and ineffective government relief efforts in the wake of Cyclone Nargis in 2008. The Irrawaddy spoke with Zarganar on Wednesday, shortly after he was reunited with his family in Rangoon. Question: How were you treated in prison? Did you face any torture? Answer: Prison conditions are not as bad as during the 1990s, when I was first jailed. I wasn’t tortured, and the prison officials didn’t even verbally insult us. But we never had any visit from the ICRC (International Committee for the Red Cross). Q: Did the government make any deals with you before you were released? A: Not at all. They came and told me about my release at 5 a.m. When I was told that I was being freed, I even jokingly asked if that meant my soul was free from my body. Q: There were rumors during the past three months about your possible release. Did you hear about them? A: No. I haven't heard anything about it. But when we heard about the announcement of amnesty on the radio, I never thought I would be among those released. Q: What are you going to do now that you are free? A: Since I believe that art and politics are interrelated, I will continue to do both of them. We have long demanded a multi-party democracy, but what we have now is a “mono-party” democracy. Since the current system is not genuine democracy, I will continue to do both politics and art. Q: There has been talk of positive changes taking place in Burma, and the US and the European Union have made positive statements about the meeting between Aung San Suu Kyi and President Thein Sein. What is your take? A: I wanted to believe in these positive changes that Daw Aung San Suu Kyi spoke about. But since this morning, I lost belief in them because I found that the government does not have a true desire to release all political prisoners. They are not really enthusiastic about the release of political prisoners. They even hesitated to release me. Why don't they release all political prisoners? Is there any cost to them in releasing the political prisoners? Since the cases of the political prisoners did not take place during the rule of U Thein Sein's government, all of the political prisoners must be released if the government wants to strive for a genuine democracy. I want all political prisoners to be released. Not only Min Ko Naing [the detained 88 Generation Students group leader], but also all other political detainees. I lived with four Buddhist monks who were jailed but are not well known to many people. I want them to be released too. Also the famous Buddhist monk Ashin Gambira, and other detainees such as Gen Khin Nyunt [the purged military intelligence chief who is still under house arrest]. Zarganar is a political football. They released Zarganar. They definitely wait and see how it goes. Than Shwe know that he is not very well, he has a few months left and he doesn't want to see his family as Ne Win and Khin Nyunt's families. As long as an old man pulling strings behind the scene, meaningful change will not take place. I'm pitying of president that he may not able hold full accountability and authority and yet he must be answerable to the whole world. What we can do is push a little bit and little bit, until old man behind curtain rested in peace. Political situation is still very ugly in Burma. This is THAN SHWE, staying behind the curtain and monopolizing everything and building a buffer zone for he and his family. The situation can be reversed at any time. Don't trust because this is not a true and genuine democracy. This are the best news I've been hearing for a long time. Welcome in real life, Zarganar! I hope this will be the beginning of a new age - freedom for all political prisoners and democracy to Myanmar! "I wanted to believe in these positive changes that Daw Aung San Suu Kyi spoke about. But since this morning, I lost belief in them because I found that the government does not have a true desire to release all political prisoners." According to the sentences I quoted above, what Zarganar said seems very controversial. It's like Aung San Suu Kyi is engaging complicity with the current government. What does he mean by saying "I lost belief in them"? So he has lost his belief in Suu Kyi already. What a bold statement!!! Needless to say we will be very happy if all prisoners except Khin Nyunt and his followers were released. I am upset about what Zarganar has said as he wished all prisoners including Khin Nyunt to be released. As we never forget and forgive what Ne win and his right hand men Khin Nyunt done to us in the past, it was just like an insult to us. I think it was no more than a euphoric gesture from the extraordinary great man like Zarganar. Welcome back Zarganar. Wishing you successful in whatever wish you would like to happen. Look forward to hearing your intellectual amusing jokes. The day is a bit brighter because of Ko Zarganar is free. It will be even brighter when all are free. Make no mistake, I do not agree with most of what they say, But nobody should ever be behind bars because of their beliefs. I write for the freedom of all therefore my own freedom. In other countries this sort of situation is only now learned of in history books, in Myanmar we are living the struggle. Indeed we are dozens of years behind. It´s a farce, an agreement between the US and the European Community with the Burmese generals, who are faking improvement in human rights, in order for the US and the EC to access the Burmese market, currently monopolized by their arch-enemy, China. Nothing is going to change in Burma. First of all, none of those political prisoners should have been in jail for the first place. Secondly, this self-elected so called gov is still using these political prisoners as the playing cards in the world stage. It is very sad that these prisoners are used for its interest. I've concluded that this so called gov is desperately seeking a place that it wants so much in the international community by taking inhumane advantage of political prisoners. The world is very happy that this very wonderful man is released. We will not rest until ALL are free. FREE ALL POLITICAL PRISONERS. Visiting Buddhist sacred sites is a complete lie until then, Thein Sein. Democracy is brought about by institutional means! Artists' role is to highlight government's failings. Kudos to Zarganar. The man is a real hero in his selfless and unflinching commitment to the people's cause as well as the release of his fellow prisoners of conscience. We must not be fooled by the govt's attempt to shortchange us with a halfhearted measure, and this goes for the Western governments too in their dual approach of sanctions and constructive engagement. Ko Zaganar is a true patriot and noble son of Burma. He has shown to all of us, that even having undergone unnecessary hardships, he has the decency to speak for the release of all political prisoners including former intelligence chief, Bogyoke Khin Nyunt. Burma's national leaders have shown the way that fortitude and human dignity in the face of adversity will bring about political change in Myanmar. Excellent! You shouldn't be behind bars. Warmly welcome. Now we can dream a brighter day for Myanmar. What so ever ,it proved that Thein Sein is not different from his old boss Than Shwe. Both of them afraid of students and monks. The lady should intervene to immediate release of all other political prisoners. At the end of the day, we find out that magics and tricks of Thein Sein are just to sustain his dictatorship. No genuine democracy in world even in US. What's about protest in Wall Street? Why corporate funded media block out the news? Let's do it step by step. If the country become like Bosnia then they know the value. Zarganar's story reminds me somewhat of Ai Wei Wei's. Both of them have tremendous courage and determination, I hope Zarganar's decision to continue pursuing change through art and politics helps to bring about genuine democracy.